Old man winter is behind us here in Bulgaria. The last few days have been pleasantly warm, and I am starting some needed spring clean up. I ate my last Pomegranate in February and now dreaming of October. 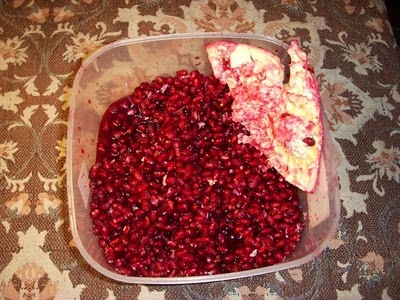 It is a toss up, because October/November brings the winter, but also the harvest of the lushes juicy red pomegranates. April 15 is creeping up a little to fast. I will be staying here in Bulgaria no later than June 1st. On the fifteenth I will head to Sofia and go the Serbian border for another visa. While I am in Sofia I will go to the American Embassy and get a new passport, then I will have a fresh passport for when I depart for the north. Boris (owner of the house) and his girlfriend stopped by on Saturday, a major surprise. So I will be seeing him when I visit Sofia. This is the cow from last November. Notice the guy on the right of the picture with his hands on his hip? That is George my next-door neighbor, and the nicest guy in the village. He helped with cutting the wood with his chainsaw and other tasks last fall. I have some ideas for my travels north. There could be a possible chance to just head to Hungary and travel the country for awhile and see what happens. Bosnia is still a possibility. The butchering of the cow last November: Some people may few this a gross, but really if your poor and need meat for the winter, this process is normal. They butchered the cow in the street of the village just down the street from my house. I came across a hostel on help-exchange.net in northern Poland that offers people to work the hostel for 4 hours a day for a free accommodation, it could be a possibility. There other possibilities but it is always the utmost importance to remain in the moment, and right now I am boiling water on my gas stove to wash dishes and shave. I might go outside today and crank up twelve buckets of water from the well to wash my clothes. have a great time moving on. We are going to Europe for a month in May/June. Haven't decided on where to go yet, but looking forward to doing the research. Mmmm, pomegranate. I have eaten one every day here in Nepal going up to Everest. It is my favorite fruit! An Excellent post, I love Pomegranate this is good. Next post: New Kittens and Family Food. Previous post: One More Month or Two in Bulgaria.